The existing design of this building was different than the older, historic brick facades so common in downtown Lancaster. The existing marble Art Deco panels were the starting point for the exterior and interior renovations and design upgrades that would add to the streetscape and pedestrian appeal of the store. Our biggest challenge in creating the design/build team was finding a contractor and sub contractors willing to work on a small custom project. The team we assembled created a panelized system of Glass Fiber Reinforced Concrete (GFRC), put over a lightweight structural steel frame, with aluminum canopy fascia materials for the exterior renovation. This worked well with the existing Art Deco elements of the exterior and saved our client $12,000. The Art Deco ambiance is first reinforced with the contemporary, red lettering of the store name above the entrance. The new canopy structure required city approval to extend it over the sidewalk. The canopy design is reminiscent of the grand movie theaters of the 1930s, adding a sophisticated, eye-catching feature easily visible to both auto and pedestrian traffic, that stands out in an aesthetically pleasing way while providing shelter at the store entrance. 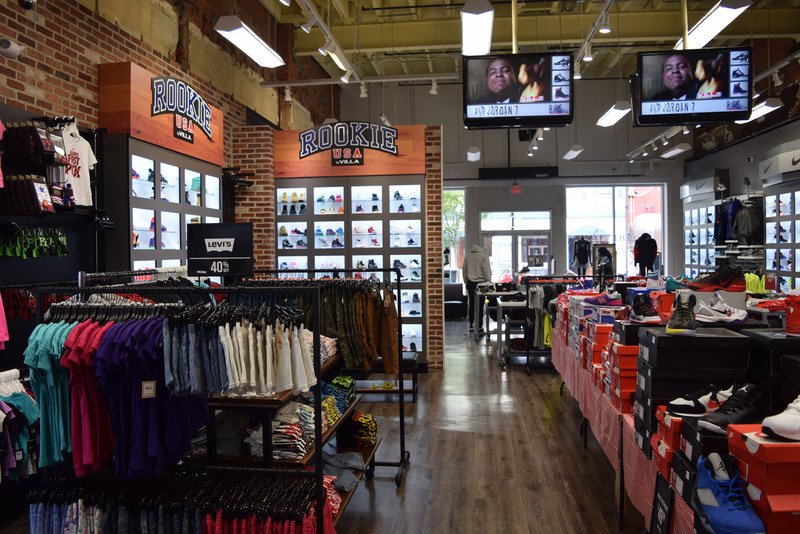 In today’s retail environment that competes with online shopping, it is essential to create an exciting experience with the design and layout of the store. 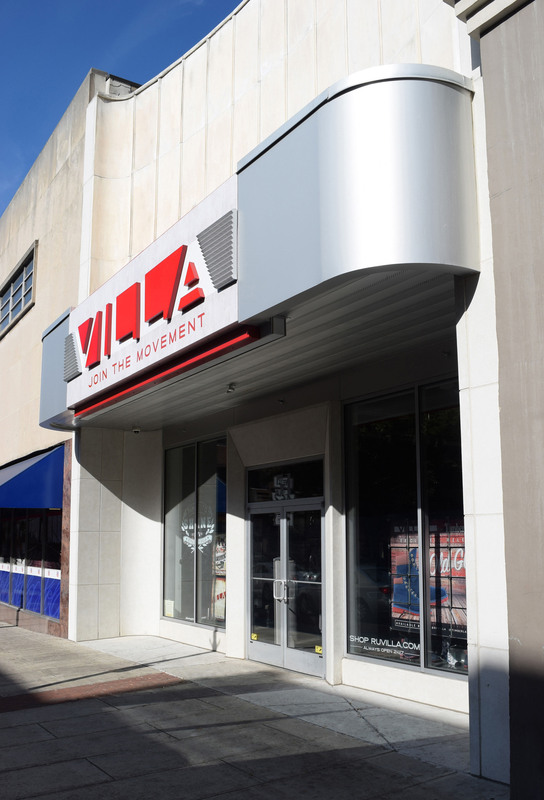 Upon entering Villa a customer is treated to a variety of colorful and engaging visual experiences, from the ceiling mounted TV sets to the large, colorful back-lit and floor rack display areas. 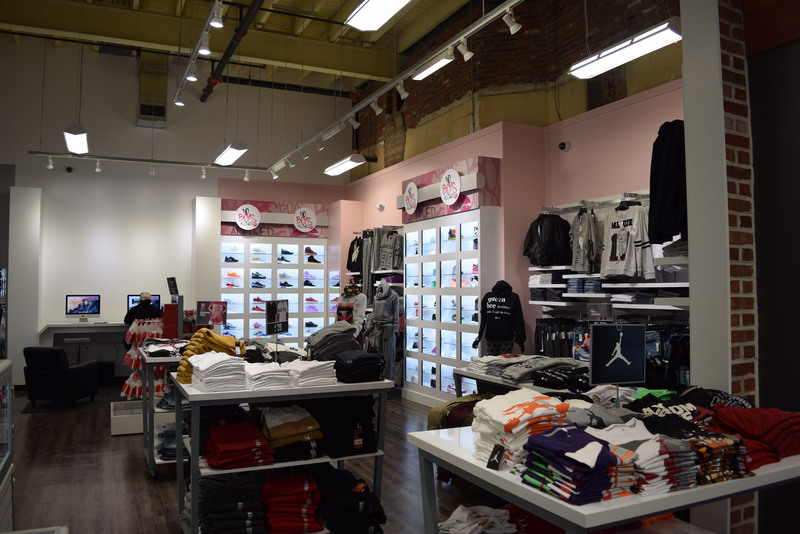 The store’s ambiance reinforces the sports-themed merchandise throughout, providing ample space for shoppers to move around without bumping into each other. We kept the original brick walls and old plaster as historic elements from the greater city environment that contrast beautifully with the modern clean lines of the store displays. Ambient lighting is important to shoppers who are doing product selections by color as well as style. Brightly lit product displays draw customers to the back of the store, an important enticement that gets them to see all the merchandise. The area for women’s merchandise is discreetly identified by the pale pink cabinetry, using subtle visual clues instead of signage. 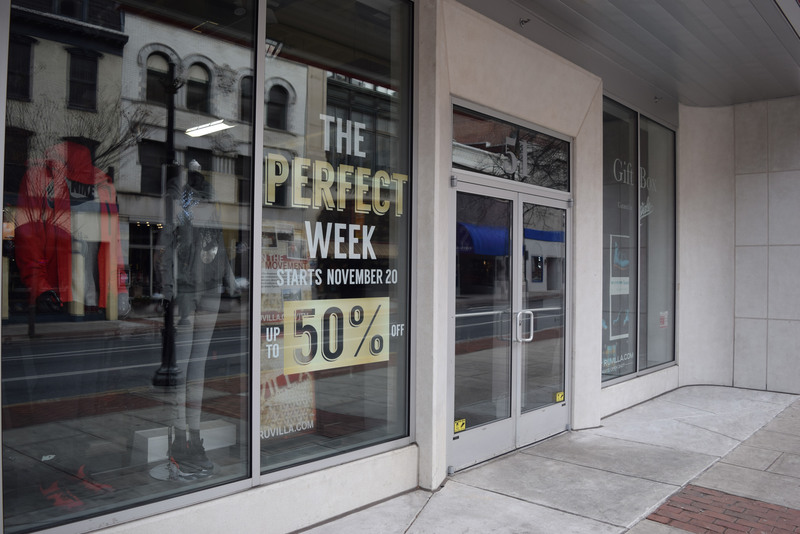 This close-up of the entrance shows the large expanses of glass windows and doors that make it easy for pedestrians to see merchandise from the street and allow the owner to put changeable signage for store promotions and city events. The glass reinforced concrete panels are designed and detailed to look like poured-in-place concrete.